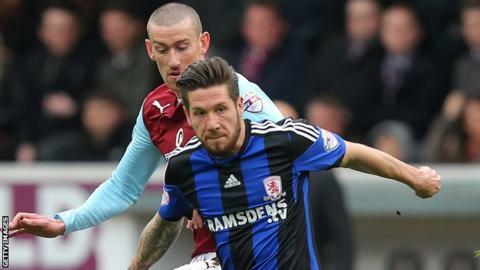 Burnley's wait to secure promotion back to the Premier League goes on after Middlesbrough won at Turf Moor. Burnley, who were relegated from the Premier League in 2010, came into the game knowing victory would secure them promotion if third-placed Derby lost to Huddersfield. But while the Rams won 3-1, the Clarets fell to defeat against a Boro side who have now won four games in a row. What happened to fortress Turf Moor? The hosts looked the more threatening in the early stages, with Ashley Barnes denied by some last-ditch defending and Danny Ings firing wide from a Kieran Trippier pass. But Aitor Karanka's men showed their attacking prowess when Lee Tomlin found space on the edge of the box before rifling an effort just wide of a post. Moments later the Clarets thought they had broken the deadlock after Kightly beat Dimi Konstantopoulos, but his looping header hit the bar and Barnes's follow-up was off-target. At the other end, Albert Adomah surged into the Burnley half and found Graham, but his first-time volley flashed over. Adomah then showed his worth at the other end, somehow blocking Ings's effort after Kightly had weaved into the area. And the Boro winger's efforts were rewarded as his side took the lead, Tomlin carrying the ball forward before releasing Butterfield, who calmly slotted his left-footed strike past Tom Heaton. It was almost 2-0 four minutes later as Tomlin went close, before Ings sent a snap-shot just wide as the hosts sought an equaliser. Konstantopoulos remained unflappable in the Boro goal and, despite the late dismissal of Ayala, they were not to be denied the points. Burnley boss Sean Dyche: "It is a top end performance by our standards, totally dominant, fantastic energy on show and it is incredible the ball didn't end up in their net at some point. "Their keeper is man of the match but the officials weren't man of the match. There were certainly two absolutely blatant decisions not given. "I have spoken to the referee and it always amazes when they say 'it is in your opinion'. I have looked at it 47 times on my laptop so I don't know how it is (an) opinion, that's what I am flummoxed with." Middlesbrough manager Aitor Karanka: "Dimi Konstantopoulos was the best player for us today - he has played very well for us in the last few games. "I am pleased with his performances and for him as when I came he was third or fourth-choice keeper. "They had a lot of chances today and we were lucky. They had more chances than us and showed what kind of team they are - one of the best in the Championship." Match ends, Burnley 0, Middlesbrough 1. Second Half ends, Burnley 0, Middlesbrough 1. Foul by Tom Heaton (Burnley). Second yellow card to Daniel Ayala (Middlesbrough). Ashley Barnes (Burnley) wins a free kick on the right wing. Offside, Burnley. Ben Mee tries a through ball, but Ashley Barnes is caught offside. Attempt missed. Ben Mee (Burnley) header from very close range misses to the left. Assisted by David Jones with a cross following a corner. Corner, Burnley. Conceded by Grant Leadbitter. Attempt blocked. Michael Duff (Burnley) right footed shot from the right side of the box is blocked. Corner, Burnley. Conceded by Daniel Ayala. Attempt blocked. Dean Marney (Burnley) left footed shot from outside the box is blocked. Substitution, Middlesbrough. Curtis Main replaces Danny Graham. Attempt saved. Nathaniel Chalobah (Middlesbrough) right footed shot from outside the box is saved in the bottom right corner. Assisted by József Varga. Attempt saved. Danny Ings (Burnley) header from the centre of the box is saved in the centre of the goal. Assisted by Ross Wallace with a cross. Corner, Burnley. Conceded by Dimitrios Konstantopoulos. Attempt saved. Ross Wallace (Burnley) left footed shot from outside the box is saved in the top centre of the goal. Assisted by Dean Marney. Corner, Burnley. Conceded by Jonathan Woodgate. Attempt saved. Junior Stanislas (Burnley) right footed shot from outside the box is saved in the bottom left corner. Assisted by David Jones. Substitution, Middlesbrough. Luke Williams replaces Lee Tomlin. Attempt missed. Ashley Barnes (Burnley) header from the centre of the box misses to the left. Assisted by Ross Wallace with a cross. Substitution, Burnley. Junior Stanislas replaces Scott Arfield. Substitution, Burnley. Ross Wallace replaces Michael Kightly. Attempt saved. David Jones (Burnley) left footed shot from outside the box is saved in the top right corner. Dean Whitehead (Middlesbrough) is shown the yellow card for a bad foul. Foul by Dean Whitehead (Middlesbrough). Danny Ings (Burnley) wins a free kick on the right wing. Foul by Kieran Trippier (Burnley). Substitution, Middlesbrough. József Varga replaces Jacob Butterfield. Scott Arfield (Burnley) wins a free kick in the attacking half. Attempt missed. Ben Mee (Burnley) header from the centre of the box is too high. Assisted by David Jones with a cross following a corner.